Do you love baking from scratch? I do. When I undertake a new baking project, I cherish getting out all of my “stuff” and laying out my pans, measuring cups, whisks, and measuring spoons. There’s nothing quite like carefully adding each ingredient and ending up with a delicious result. Our newest publication, Bake from Scratch, celebrates the many joys of scratch baking that so many of us learned growing up. I remember the whirl of my mom’s mixer as the cake batter formed beautiful waves in the bowl. And who could forget the drama of whipped eggs whites as they transformed into a perfect meringue? In this first issue, I loved the way our test kitchen chef illustrated baking techniques, like how to brown butter. Through the step-by-step photos, I could see how my browned butter turned to burned butter and when to call it done. 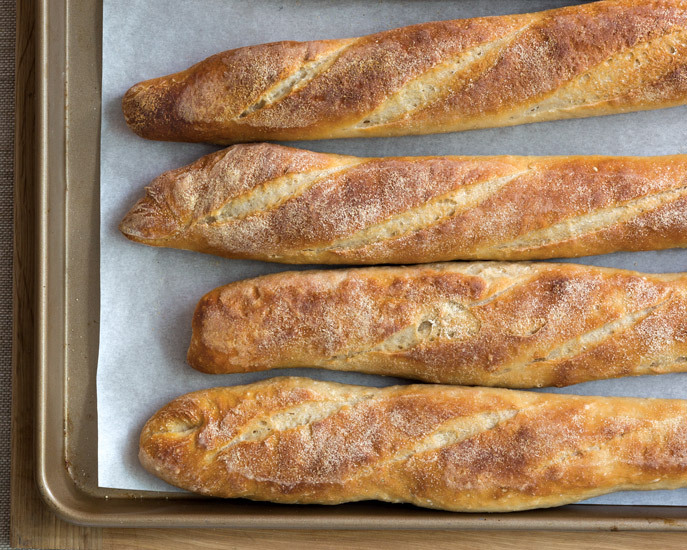 Breads are also one of my favorites, and the experts have included an essential sourdough starter with ways to turn it into baguettes, boule, and ciabatta. For those of you who love to bake, this magazine captures the artistry of your craft. What are you favorite things to bake from scratch? I absolutely love baking from scratch. I’m getting my almost 3 year old granddaughter involved with helping me put the ingredients in the mixing bowl. She absolutely loves it!! I only hope that she will remember all the fun times we’ve had baking birthday cakes for our family. Breads – It’s like magic watching the loaves rise – it smells like magic when guests enter – and there is never any left after my 6 sons get to the table! they magically make it disappear! I think we need to really bring cooking and baking back into the school’s, I’m just amazed at how people think I’m crazy to bake, or cook, and don’t get me started on canning! To be able to assemble a few ingredients, and put them in pans, tin, and cook them and then eat them is a wonderful time indeed. Oh this was wonderful to read. My husband and I have discovered scones and especially like coconut ones — your coconut chocolate chip sounds delightful. Would you be open to sharing the recipe? There’s nothing quite as therapeutic than kneading dough or creating something delicious from powdery flour. The greatest reward for me isn’t the finished product, it’s seeing and hearing the enjoyment from its recipients. I especially cherish the opportunity to bake from scratch with my now 24 year old daughter, passing down to her family recipes given to me from my mother, grandmother and aunts. Recently my daughter and I took a macaron baking class together and we had so much fun trying to conquer these little morsels while remembering our family trip to Paris. I love baking whatever brings joy to my family. Baking Chritmas goodies is my favorite. It’s the time of year in the kitchen that brings back so many wonderful memories. I am looking forward to seeing the new magazine. Already bought the magazine, it is gorgeous, can’t wait to try the 1234 cake! I am known for my pies but only bake those when company comes. Each week or so I bake a batch of biscotti so my husband and I have a lower calorie anytime treat. The upcoming holidays with give me a wonderful excuse to fire up the ovens. My favorite things to bake from scratch are pies, especially chocolate (a specialty according to my family), pecan, apple and pumpkin. There is nothing better than bakery treats prepared from scratch! I enjoy baking cakes, cupcakes, all types of pies, scones, and quick bread. Occasionally, I make yeast rolls using my Danish friend’s bakery recipe. Right now, I am experimenting with baking pies in a cast iron skillet. Yum! Baking from scratch, it’s a labor of love. Not only for those who are fortunate enough to eat the “baking”, but also for the baker. I get great joy out of baking, I can’t wait to receive my copy of the latest publication. Perfect timing for the holidays, Phyllis. Thank you! I bake muffins all the time. I vary the add ins usually reflecting the season. And I always bake chocolate chip cookies for my son….still his absolute favourite. Yesterday my two granddaughters, Maddie, Nella and I baked a batch of pumpkin spice cookies. They love to break the eggs and do all that stirring. We used my favourite mixing bowl from my mother in law. There is no telling how old and how many times it has been used. We put icing on about half the cookies. I let them go across the street and share with a neighbour. They were delicious. A glorious day. Blessings to you as Bake from Scratch makes its debut. I love baking from scratch and cannot wait to check out this new magazine. As I have grown older I really do cherish baking from scratch… You created it all by yourself and it makes it feel so much more special! Sometimes you tweak a recipe and replace it with another or different ingredient and that makes you feel confident that you do not have to follow everything by the book, that is called imagination and I love that! Happy Baking To All You Girls! Enjoy and Thank You Phyllis for always writing such a great blog! Great interview with Paula Deen! My second favorite?…any kind of pie, but especially apple crumb. Since I am a scone and tea person , scones are one of my favorite things to bake.especially coconut chocolate chip.